53rd Girl Scouts National Convention! 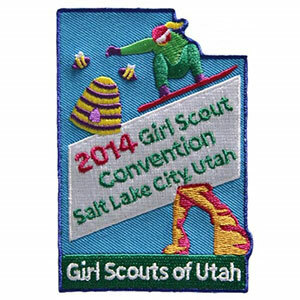 The 53rd Girl Scouts National Convention came to a close yesterday in Salt Lake City, Utah. 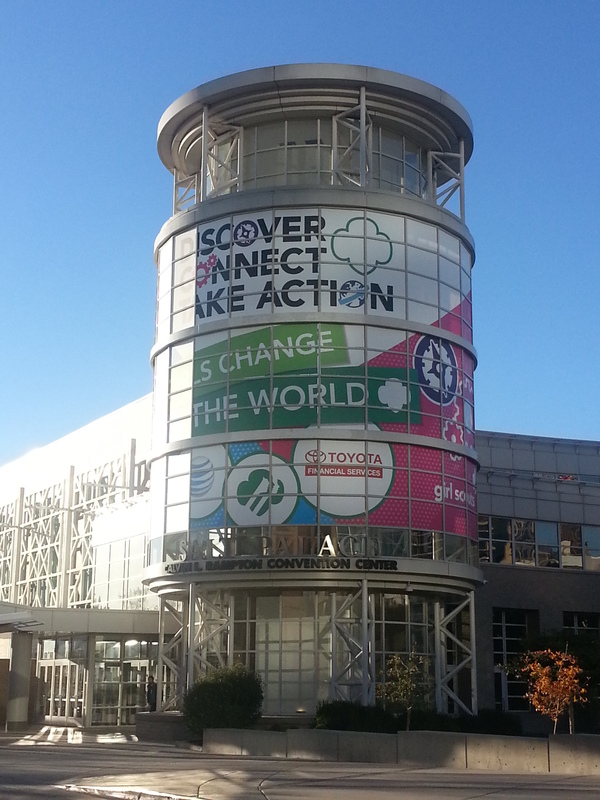 It took place October 16 – 19 and this year’s theme was “Discover, Connect, Take Action: Girls Change the World!” At each and every Girl Scout National Convention speakers and entertainers from across the country and globe lead sessions and offer numerous opportunities for personal and professional development as well of lots of Girl Scout networking. Many people, from GSUSA CEO Anna Marie Chavez to the famous exhibition basketball team, Harlem Globetrotters, were there this year to help facilitate the learning for volunteers and staff from Girl Scout Councils across the country in fun and interesting ways! One of our very own committee members, Pamela Nye, was at this year’s National Convention representing the Girl Scouts of Greater Atlanta Archives Committee! She not only attended the 2014 Girl Scout History Conference that took place right before the convention on October 14 – 16, but she presented there too! Pam gave 2 presentations, one was an Archives 101 for Girl Scout volunteers all about how to easily create and organize your archives collection and the other was about metadata, how to easily create information and descriptions for any stored data and archives that Councils may already have. She also served on several panels answering questions about archival practices and how they apply to your own troop and council. 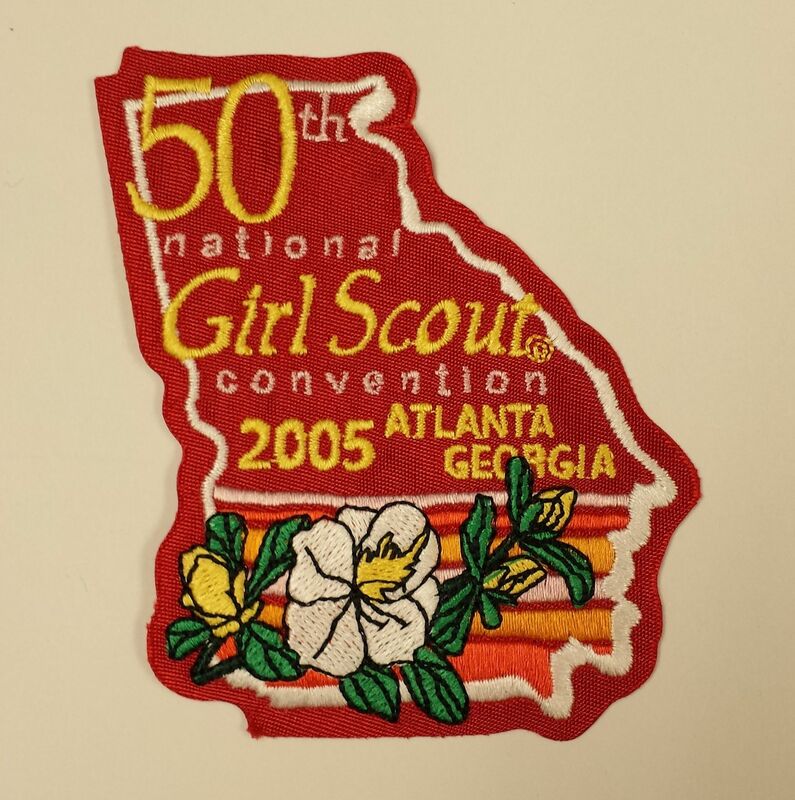 Did you know that 9 years ago, in 2005, the 50th Girl Scout National Convention was held here in Atlanta? At the time, before the nation-wide council mergers of 2008, there were 8 Girl Scout Councils in Georgia. 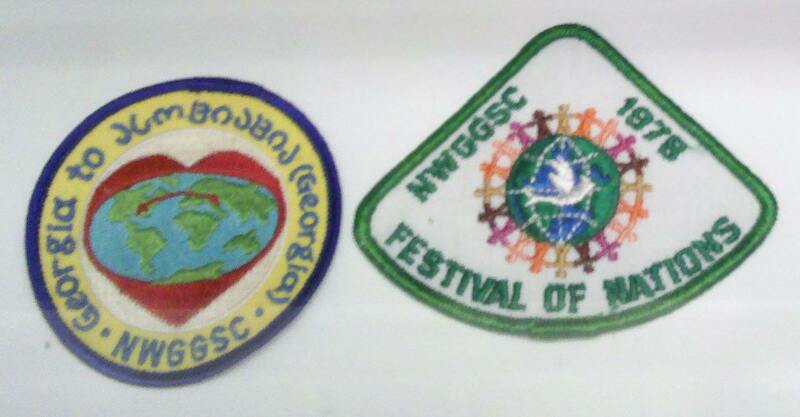 The 3 Greater Atlanta area councils that hosted the 2005 convention were the Council of Northwest Georgia, Northeast Georgia, and Pine Valley. The 2005 convention was held October 7 – 10 and while the Girl Scout History Conference was not held before the convention that year, one of the presentations in the Hall of Exhibits that year was “Girl Scouts Make History,” where you could learn all about Daisy, the house in Savannah in which she grew up, and lots of other things like vintage uniforms, dolls, and other collectibles. It has already been announced that the 54th National Girl Scout Convention in 2017 is going to be held in Columbus, Ohio, and the Girl Scouts of Greater Atlanta Archives blog will have more info as it becomes available! We can’t wait and hope to see you there! Camp Timber Ridge Turns 90! 2014 marks the 90th birthday of Camp Timber Ridge in Mableton, GA! Now, that’s a lot of camping! In October of 1924, the Civitan Club of Atlanta deeded 39.5 acres of land in Mableton, 12 miles west of today’s Metro Atlanta, to the Girl Scouts of Atlanta and then in November of that same year an elaborate opening ceremony was held. The establishment of the camp was largely due to the help of Mrs. Albert Thornton, who gifted $1,000 (big money back then!) for a central dining hall and recreation hall to be built on the property. The first camping season was in the summer of 1925 between June 22 and August 8 and the original buildings on the site included the office, infirmary, nature hut, art hut, rest hut, and of course, the tents! 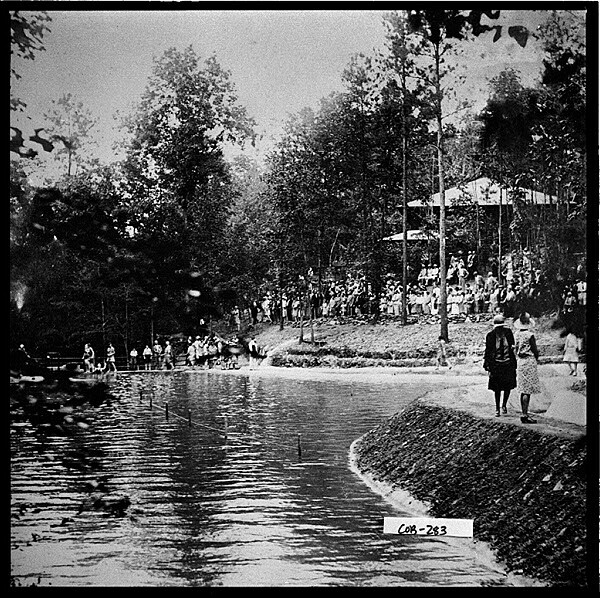 Camp Civitania was renamed Timber Ridge in 1953 and then in 1971 the Timber Ridge Environmental Center was born. The Timber Ridge Environmental Center, known as TREC, was made up of 30 acres of wooded land, designed to teach about the history of the land as well as its use and to demonstrate natural forces at work. Camp Timber Ridge has grown over the years and now consists of over 220 acres of wooded land (both hardwood and pine forests), natural streams and even a bamboo forest! During the summer, girls can choose between day camps or sleepaway camps, platform tents or cabins. Troops can also reserve a campsite at any time during the year for a troop bonding weekend! 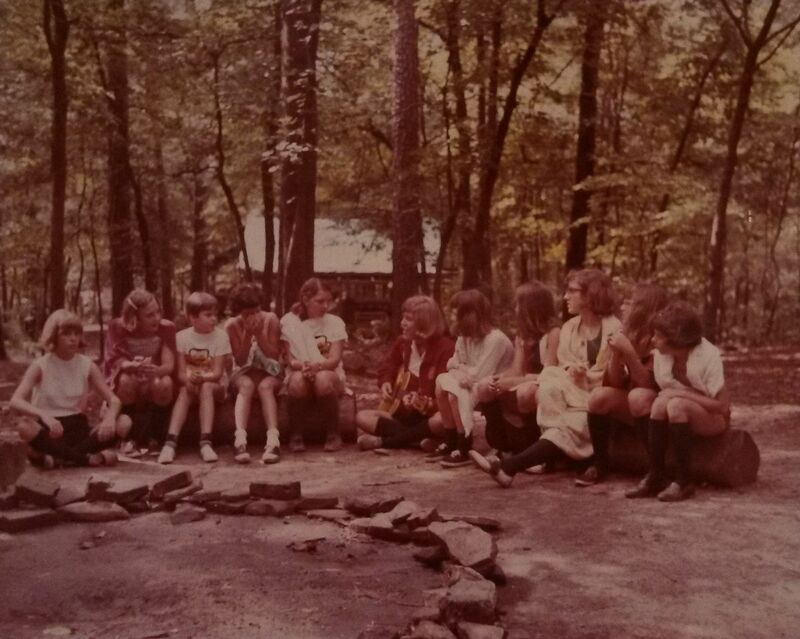 Today, Camp Timber Ridge remains one of the largest girls’ camps in the South still in operation! 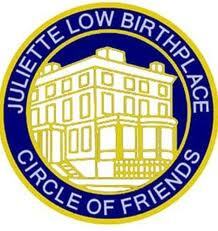 Any Girl Scout will tell you that at least once in her life, she would like to visit the Juliette Gordon Low Birthplace or that the visit to the Birthplace was one of the highlights of her Girl Scout career. Located in Savannah, Georgia, the house on East Oglethorpe Avenue is where Juliette “Daisy” Gordon was born on October 31, 1860. Girl Scouts of the USA purchased the Gordon home, also known as the Wayne-Gordon House, in 1953 from Mrs. George Arthur Gordon. Restoration of the house has been almost continual since then. In 2007 a study was conducted by an engineering firm to help plan for the structural restoration and updating the facade of the house. Work began in January 2009 and will be complete by the end of 2011 with the restorations of the garden. The Birthplace has teamed up with the National Trust for Historic Preservation with the “This Place Matters” campaign to honor your favorite places and make a call to protect, enhance and enjoy the places that matter to all of us. Every troop who visits the Birthplace takes a picture of the troop together, holding a sign that says “This Place Matters,” because all Girl Scouts do care about the Birthplace. You can also help the house by joining the Circle of Friends, by making a donation to the Preservation and Travelship Endowments, or through a planned gift. The annual membership contributions to the Circle of Friends continue to grow the critical preservation endowment that will fund future maintenance and preservation projects for our irreplaceable National Historic Landmark site. In 2012 the Girl Scouts of the USA, as you might have guessed by now, will turn 100 years old. There are celebrations being planned all over the United States, and here in Georgia, there will be many places to participate. Events will be happening in the Atlanta area, the Savannah area (birthplace of GSUSA), and in many towns throughout the state. LaGrange, Georgia, situated in Troup County, has had a long history with Girl Scouting. 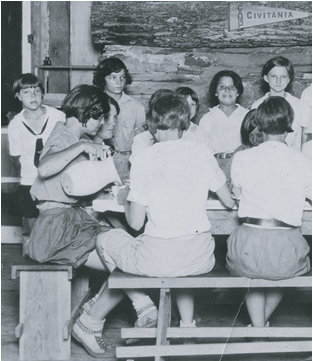 In 1930, the LaGrange Girl Scout Council was chartered by the Girl Scouts of the USA. By 1958, this Council was merged into the Pine Valley Council, covering most of middle Georgia. In 2008, Pine Valley Council merged into the Girl Scouts of Greater Atlanta. Right now, the Girl Scouts in Troup County are celebrating the 100th Anniversary of Girl Scouting with a Membership Drive. Early next year, the Legacy Museum on Main will have a great exhibit on Girl Scouting in Troup County. The Legacy Museum Curator, Laurie Sedicino, recently paid a visit to the Girl Scouts of Greater Atlanta Archives to see if there are any records or artifacts from the Troup County area which could be loaned for this exhibit. She met with some of our volunteer staff, and not only viewed records and artifacts, but also had a tour of the Council facility. We enjoyed her visit, and look forward to working with her on this project. To the right is the sash that Sue and Laurie were inspecting in the picture above. 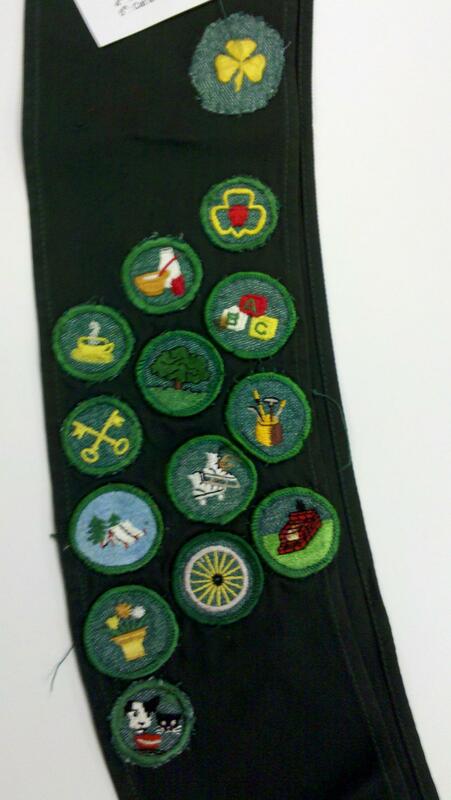 In slanted rows, the badges are: 1) Hostess, Cook, My Troop; 2) Housekeeper, Tree, Childcare; 3) Adventurer, Skating, Dabbler; 4) Interior Decoration, Cyclist, Back-yard Camper; 5) Cat & Dog. The permanent exhibit gallery of the Legacy Museum on Main, in the renovated first floor of the 1917 landmark bank building, features the history and development of West Georgia from Indian settlement to present day. The exhibits spotlight major events in the region and the stories of the people who responded to the events, as well as bringing to life the people who explored, settled and transformed the region. 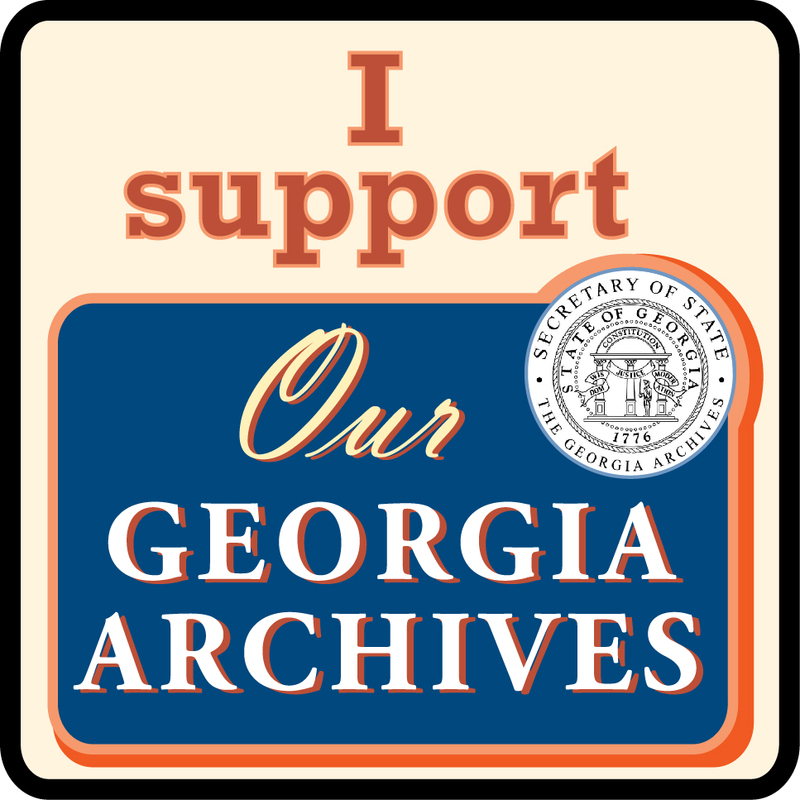 What is Georgia Archives Month? 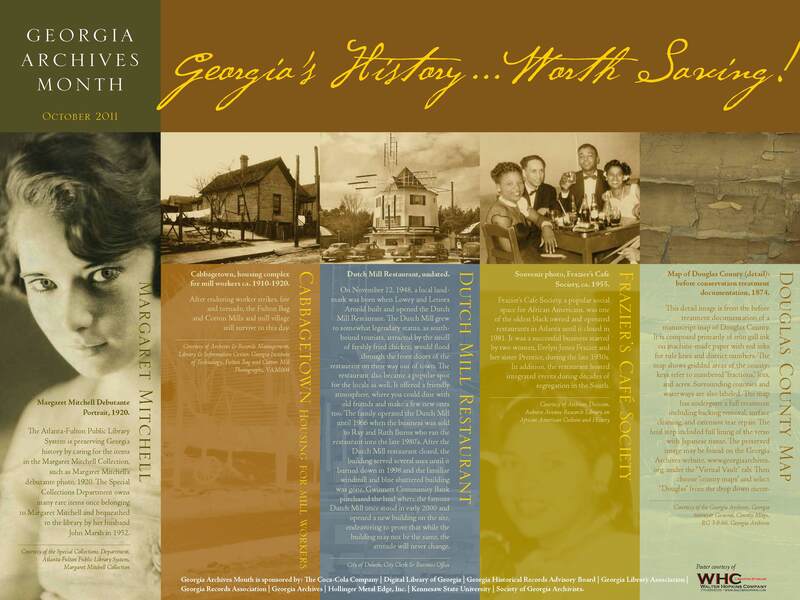 The purpose of Archives Month is to celebrate the value of Georgia’s historical records, publicize the many ways historical records enrich our lives, and recognize those who maintain our communities’ historical records. This is the ideal time to call attention to the Archives of the Girl Scouts of Greater Atlanta and its work in preserving Georgia’s documentary heritage. 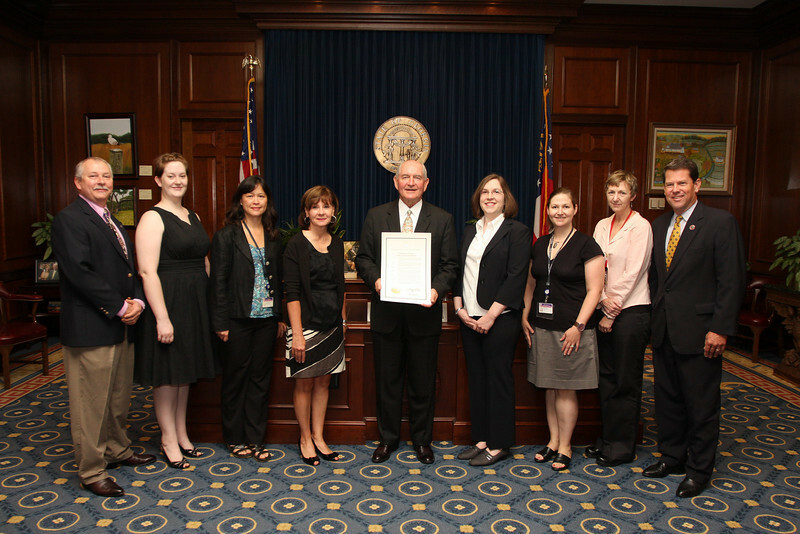 Governor Sonny Perdue signed the Georgia Archives Month proclamation on September 9, 2010. 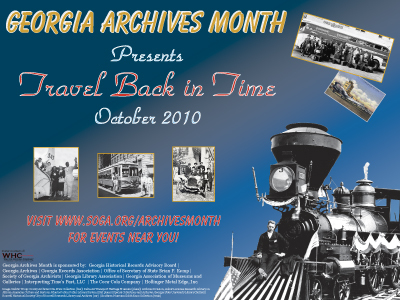 There are many events and exhibits created for Archives Month each year in Georgia, and the list of 2010 events is available in PDF. Georgia’s celebration of archives and history is part of a larger celebration throughout the United States. Archives Month originally began in New York in 1989 as “New York Archives Week,” and then the idea quickly spread to other states. The Society of American Archivists also celebrate October as American Archives Month. For 2010-2011, SAA is focusing its public awareness efforts on a year-long campaign—I Found It In The Archives!—that reaches out to archives users nationwide to share their stories about what they found in the archives that has made a difference in their lives. 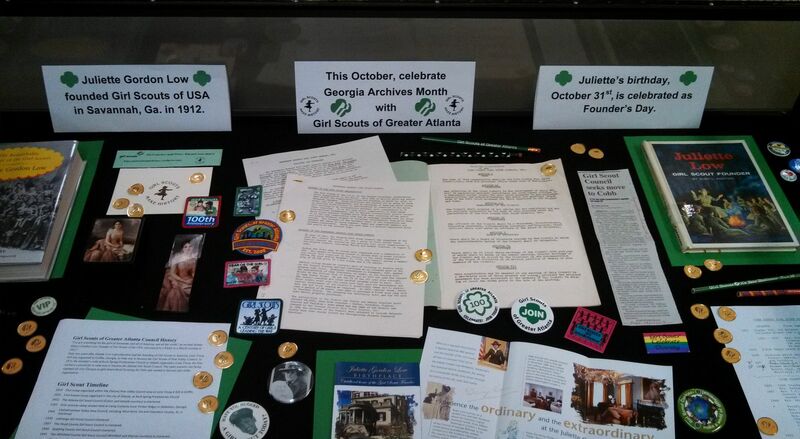 The Girl Scouts of Greater Atlanta is proud to post this year’s Georgia Archives Month poster in our Service Center while we travel back in time and learn more about our founder, Juliette Gordon Low, the history of our Council, and the history of Girl Scouting. To see posters from all over the United States, please visit the website of the Council of State Archivists.